So, for fun, I've been cataloging every critter that comes into, lives on, or flies over our little postage stamp in urban Covington. I'm frankly impressed. When I was very young, I was very much the junior naturalist. I tramped far and wide in my semi-rural neighborhood through hundreds of acres of woods, along streams and ponds and the like. I was always looking for different species of critters. And I saw a lot (there wasn't much else to do). So, when I say that I may have seen more bird species in 9 months over and on this postage stamp than I did during my childhood, it means something. 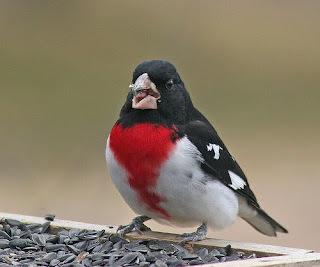 The latest was a Rose-Breasted Grosbeak. My first. We've also added a mocking bird and a tree swallow to the list. I'm sure there will be a number more as we go through summer and fall migrations. I theorize that we're seeing more birds than when I was young because of a number of factors. More raptors due to the DDT ban, more birds due to habitat preservation and feeding stations, and probably more birds in general due to the efforts of Ducks Unlimited and various conservation groups and birders. In any case, for the price of 20 lbs. of sunflower seed and a like amount of generalized bird seed, this is pretty cheap entertainment. Kinda cool, if you ask me. If you haven't seen Hooked On House, check out Julia's Blog Party...she's hooked on porch swings . That's really an amazing list. My husband loves birds and is always watching for different ones in our wooded backyard. We get hawks on our back deck a lot and have a very noisy owl (or two) who likes to make a racket when we're trying to sleep with the windows open. Mother's Day gift to myself: Window sills.